Before going for an afternoon hunt last week I stopped by ye olde Starbucks for some turbo juice– a little ritual that gets my brain going before the legs, which generally is a good idea. Walking to the front door I nearly stepped on a healthy looking pigeon. That plump little sucker was a nice reddish color, not the slate dirty grey most pigeons have. I like to think of myself as a meat hunter. I don’t hunt what I can’t eat. But I’ll admit, the carbon cost of getting to the places where I can find critters I can kill is usually not a net win. So it struck me. Why don’t I just give this pigeon a boot. A faux off-balance step, a swift toe-punch, one that could be mistaken by the people in tight black clothes around me as the clumsy stumblings of a sleep-deprived dad? Albeit one with a tragic end? It vexed me enough to stop and take this photo. While I bust a couple coveys with the Pup, I got no quail on the hunt that day. I saw the pigeon again today. 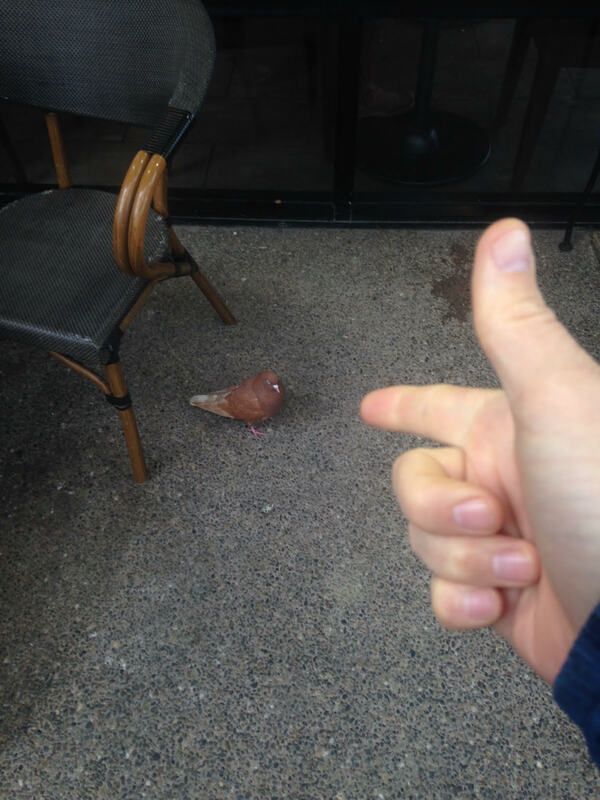 Keep it up pigeon. Your days are numbered. People pay a lot of money to eat squab. And dove hunting is a big thing in places like Texas. Squab is just pigeon (though probably not city pigeon), and doves and pigeons are a lot alike. I’ve had pigeon before, it was pretty good, almost a red meat. Dove hunting is done here in Cali too, though I’ve not done it yet. I would have no problem eating them if i could find a nearby place to do it legally. Starbucks probably wouldn’t count.